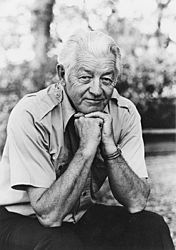 In honor of the centennial of Wallace Stegner’s birth on February 18, 2009, the Wallace Stegner Center, in collaboration with on- and off-campus partners, has planned a series of activities celebrating Wallace Stegner’s life and legacy. The activities will begin with the College of Humanities 2008 Lyceum II Lecture, “From the Arctic to the Everglades: An Evening with Peter Matthiessen and Subhankar Banerjee” and conclude with the Stegner Center’s 14th Annual Symposium, “Wallace Stegner: His Life and Legacy,” which will feature such luminaries as Bruce Babbitt, Wendell Berry, Patty Limerick, Page Stegner, Charles Wilkinson, and Terry Tempest Williams. The Stegner Center’s partners in planning and hosting the various Stegner 100 celebrations include: Chevron, The City Library, the Nature Conservancy of Utah, Salt Lake City Mayor’s Office, the University of Utah College of Humanities, the University of Utah Marriott Library, the University of Utah Press, the Utah Humanities Council, and the Utah State Historical Society.